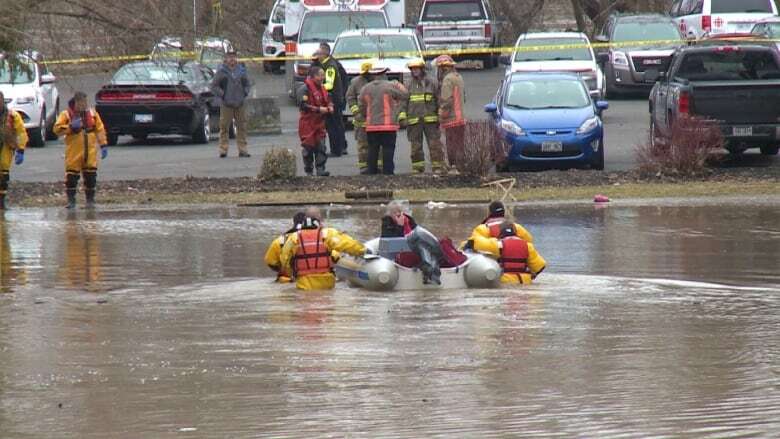 Residents in Chatham, Ont., were being rescued from their flooded homes Saturday, after the swollen Thames River overflowed in the downtown core and surrounding areas. The Chatham-Kent Fire Department saved seven people from their flooded homes Feb. 24, 2018. Water levels rose before the residents evacuated. No one was injured. Fire, paramedics, and other first responders have warned people to evacuate from their homes if they feel at risk of flooding. Officials say water rescues get much more dangerous overnight. A state of emergency was declared in Chatham-Kent and Thamesville on Friday as the Thames River in those regions continued to swell, causing flooding and damage. The Lower Thames Valley Conservation Authority (LTVCA) said the Thames River in Chatham was expected to peak between 7 and 9 p.m. ET on Saturday as water moves downstream to the area. Though that timing fluctuated throughout the day as the LTVCA monitored the river system. Rain and thunderstorms were expected in the area, according to Environment Canada. The weather authority said rainfall amounts could be in the 10- to 20-millimetre range, ending early Sunday morning. Overnight the water levels rose quickly. Residents were asked to voluntarily leave their homes and gas was being shut off to many as a precaution on Friday. But some people living near the Thames River in Chatham woke up to flooded homes and needed to be rescued by fire services on Saturday. "We had the issue of how do we get them out because the water is so high," said Chris Case, assistant chief at Chatham-Kent Fire Department. Case and his team, along with EMS and water rescue crews, pulled seven people and their pets from homes safely, near Lacroix Street, using boats and a water rescue team to get people out. More people were recovered through the day and EMS and the fire department plan to work through the night into Sunday. A few of the businesses that line the Thames River in downtown Chatham have already experienced flooding in basements and properties. Mike Woodcock owns Absolute Sound, where he sells high-end stereo equipment. Woodcock was up most of the night carrying stock up from his basement as more than a metre of water pooled in his business. "I just kept marking a pole inside of the basement every time it would rise," he said, adding he once lost all of his equipment in a flood in 2008. At one point, Woodcock was in his underwear and boots lifting equipment out of the cold water. He said if there is a swell or more rain comes, "it's going to be a big loss." Woodcock said it's just his "stuff" and he is more worried for vulnerable neighbours and community members. Water levels were rising potentially 30 centimetres by Sunday morning. On Friday night, about 70 per cent of residents in Thamesville had evacuated. The LTVCA said Saturday morning roads are no longer expected to flood there. An emergency shelter was opened at the John D. Bradley Centre at 565 Richmond St. in Chatham at about noon on Friday. The municipality said residents who want to use the shelter should call 519-360-1998 for details. The Chatham-Kent Fire Department will provide updates throughout the day on Twitter at @ckfiredept .